Tim Samuel, Owner and Director of Tim Samuel Design, has been designing and building outdoor areas for almost 20 years. His experience has been gained in landscaping, pool building and residential building works. Tim and his team are passionate about what they do. They have spent years honing their skills and because of their extensive skill base, they do the majority of the work ‘in house’. When it comes to specialist work (electrical, plumbing, metal fabrication and so on) they have a small, dedicated and loyal team of subcontractors and artisans who work closely with them. Harrison's Landscaping has been designing and installing pools and gardens for nearly 10 years. Based on the Northern Beaches, Harrison's employs over 25 talented designers, architects,landscapers, stone masons and carpenters. Harrison's is also a fully licensed pool builder. 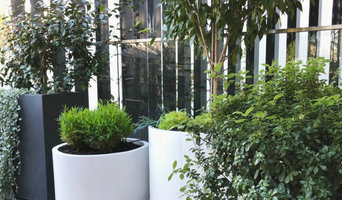 Our landscape design team has designed projects all over Sydney and NSW. Josh Harrison's landscape designs have featured in magazines such as Belle, Vogue Living, InsideOut and TV shows such as Grand Designs. 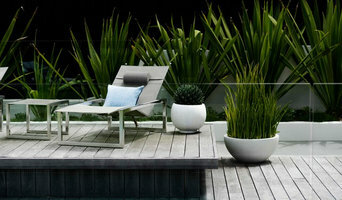 terraneo is a Sydney based landscape design and construction firm offering a revitalised approach to garden design. Our passion is crafting unique and beautiful gardens that are as individual as our clients. Our services extend far beyond the design stage, providing quotes for the installation of our designs to be installed by terraneo and also for the installation of those design by other designers. We work closely with our clients and other designers, architects and industry professionals to ensure that your vision becomes a reality. 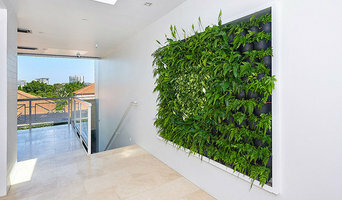 terraneo's balcony garden design featured in the 2014 Sydney Garden Show in Centennial Park, where it was awarded the silver medal and praised for its use of space for a modern family in an urban setting. Qualified in design, horticulture and construction, principal and lead designer Courtney Taylor has a passion for creating beautiful outside spaces that will help your outdoor space reach its full potential, add value to your property and change the way you live. Sand and Stone Landscapes are an award winning landscaping design and construction company based in Sydney. As a full service company, we undertake the entire project from design through to construction and follow up collaboration. All our work is completed to the highest professional standard. We pride ourselves on our service, workmanship and creations of excellence. Landscape designer and horticulturist specialising in residential and commercial design, aiming for designs that are timeless, and landscapes that grow gracefully without conforming to a particular style. Design concepts or construction drawings are drawn on CAD and to scale. I can also collaborate with a landscape construction contractor to give you a full design and installation package. Lyn Hughes and Michelle Davies – have amalgamated their passion, experience, and knowledge to create an interior and landscape design service that offers their clients a unique, unified and seamless design concept – inside and out! Lyn has been involved in many renovations, new home constructions and property developments in the Sydney Metropolitan area, specialising in specifying internal/external products and colours, and internal layout design. Michelle Davies is a qualified Landscape Designer, drawing on her knowledge and design skills with a background in retail Floristry and Interior Design Her passion is to infuse the inside with the outside enticing her clients to enjoy their surroundings to the fullest. Together they make and amazing team! At Designing Inside Out, we believe that our work, home and outdoor living spaces should reflect who we are and how we like to live. To create your vision, we listen to your thoughts and ideas, taking into account your budget and lifestyle. With this insight, we work closely with you to create aesthetic and functional Design Solutions that are in keeping with your vision on every level. Our services encompass all interior, exterior and landscape designs which harmonise with each other, giving a total lifestyle concept. Our success lies in our reputation for listening carefully to our clients needs, suggesting innovative ideas, and focusing on each element to create beautiful homes, workplaces and leisure spaces that reflect your vision. We have worked on projects ranging from private residences, property developments and display homes to a mix of hospitality and corporate projects. Native Ascent is directed by Marjan Medhat, a qualified Horticulturist, Landscape Designer and Florist. Over the last ten years, Marjan Medhat has worked predominately as a Landscaper through Native Ascent, the Sydney Royal Botanic Gardens and other landscaping firms. Throughout this period, Marjan has accumulated contacts with whom she works, and engages as subcontractors to assist with different projects as per required. Marjan Medhat started her Horticulture career in Holland as a Florist. After completing a four year trade diploma in floristry, she went on to further her creative interest and ability in the Art of Floristry known in Northern Europe as 'Masterbinding'. In 1999, Marjan came to Sydney and embarked on a career change and studied Landscape Design. She attained her qualifications with distinctions whilst completing an apprenticeship at the Sydney Royal Botanic Gardens, throughout which she has been developing Native Ascent. Native Ascent acknowledges and embraces the vast existence of tastes, needs and desires, and recognises the need for diversity. We are therefore particular in approaching each project with a fresh, original and specifically appropriate vision to suit you, your needs and desires, and your environment.